I’m teaming up with my sweet friend Elle of Living in Color Style, today for part 2 of our Summer Prints series! You can see part 1 – Florals, HERE! Pineapple has been a HUGE trend this summer, and I definitely don’t mind! I’ve been wearing it all summer long, as seen here, here and here, and I don’t plan on stopping anytime soon! It’s such a fun print to pair with other bold colors, as you can see Elle and I both thought of doing…me with hot pink and Elle with a fab neon! Who else has been obsessing over pineapple this summer, because we allllll know I am!! You can see more of Elle’s look over at Living in Color Style! Next Post Take Me to the Seashore and a Blog Sale! You both look so chic! 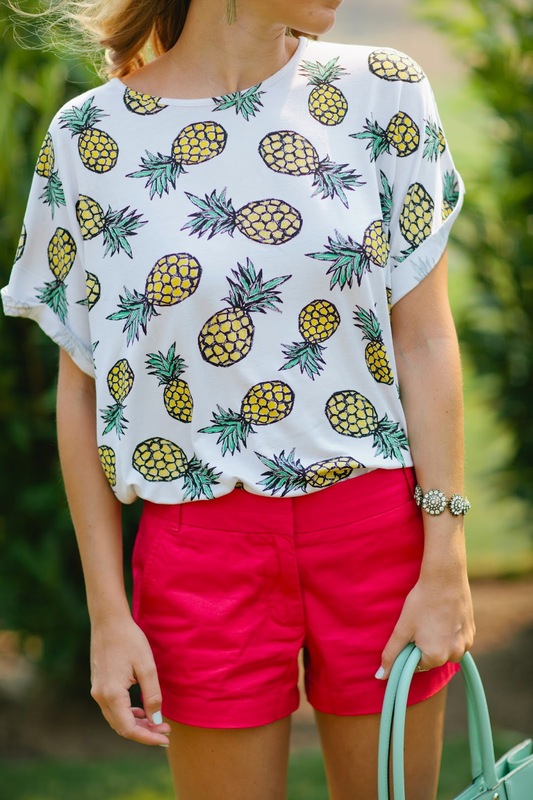 Love the pineapple top paired with those red shorts! your pineapple tee is darling! I'm obsessed over these shorts. I just need to raid your closet.